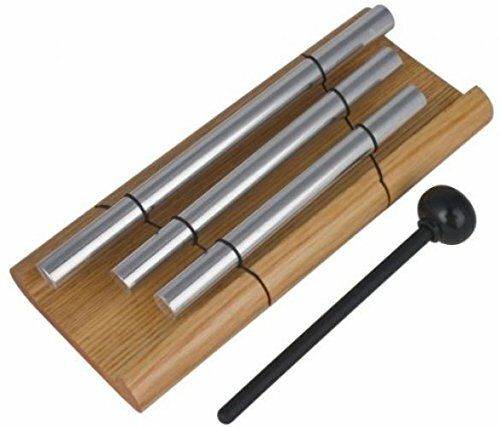 Woodstock Zenergy Chime - Trio-Relax, refocus, re-energize: good vibrations from this trio of tuned bars. For best results, play the Zenergy Chime quietly, being careful not to dampen the sound by letting the mallet rest on the rod after striking it. Then take a deep breath and listen. Relax. Refocus. Reenergize. Comes with a mallet. This Zenergy Chime includes a keyhole slot on the back so it can be installed upright on a door or wall. The mallet handle slips in between the chime and the wood for safekeeping, and voila! your Zenergy Chime is always ready to go, right at your fingertips! All chime carries a lifetime tuning guarantee. If you have any questions about this product by Topemontly, contact us by completing and submitting the form below. If you are looking for a specif part number, please include it with your message.